Some people love the French open for the graceful playing styles as pros manipulate and work around the court’s dust. Other audiences love the suspense of a ridiculous upset! 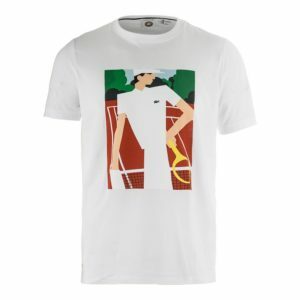 If you indulge in the art scene surrounding Paris then the Lacoste French Open Tees will be the apple of your eye! Lacoste has suprised their followers and fans with many surprises this month like the debut of their “New Crocodile,” Novak Djokovic. Now, three just released tees are artfully styled similarly to the geometric shapes and rectangular designs popular in the art deco movement. These graphic tee shirts inspire fans to enjoy the pioneering spirit of tennis and to love the history of Roland Garros. The Croc the Game Graphic Tennis Tee is the go-to for true Lacoste fans. 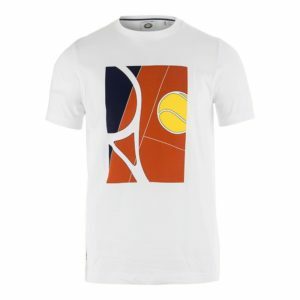 It’s the only printed top from the collection and contrasts greatly with white lines on a clay orange court. 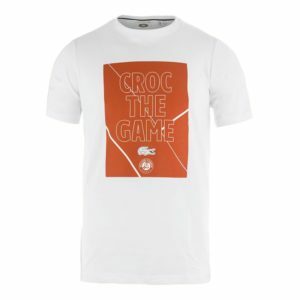 It features the text “Croc the Game,” on the shirt because one day when Rene Lacoste lost a bet to his team captain over a crocodile suitcase, a journalist used that object for a little creative writing and compared Lacoste’s fighting playing style to a croc in action. 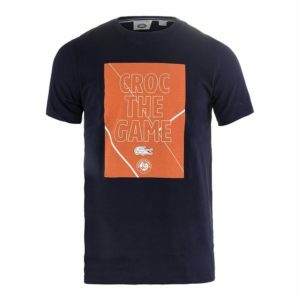 Rock this crock tee, available in navy blue and white, just in time to see who takes the slam this year. The grace and elegance of Roland Garros stands out in the Men’s Vintage Ad Graphic Tee. 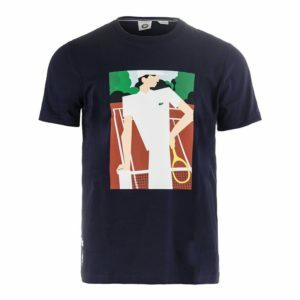 Lacoste makes the game look recreational with a graphic of a tennis player relaxing on a net over a navy blue or white tee. It’s an understated way to deliver Lacoste’s long time impression and your love for the fundamentals of the game. 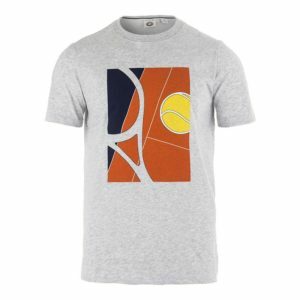 Whether clay is your favorite court season to watch or if you perform best on it, the Men’s Tennis Racquet Graphic Tee in white or gray will be your favorite tee this season. The simple graphic on this top puts forth the essentials of tennis: the ball, the racquet, and the court. The orange court, just like during a real match, becomes the focus and the racquet is muted by feeding from the same color as the tee. For clay court fans and Lacoste lovers these shirts are the straight forward way to make the point clear – French is the best time of the year! ← WTA Legging Takeover!! Top 7 Tennis Leggings for the Practice Court!